Echinacea ‘Rocky Top Hybrid’ is a coneflower cultivar that typically grows to a compact 60-75cm tall. It features daisy-like coneflowers with well-spaced, upward-turned pink rays and black central cones. Flowers bloom from June to August with some sporadic later bloom. The upturned ray flowers of E. tennesseensis distinguish this species from other echinaceas which generally have reflexed ray flowers. Narrow, lanceolate, dark green leaves (3-5” long). The dead flower stems will remain erect well into winter and, if flower heads are not removed, may be visited by goldfinches looking for seed. Echinacea comes from the Greek word echinos meaning hedgehog in reference to the flower’s spiny center cone. E. tennesseensis is only known to exist naturally on certain glades near Nashville, Tennessee, and is on the Federal Endangered Species List. Echinacea is a genus of herbaceous flowering plants in the daisy family, Asteraceae. The nine species it contains are commonly called purple coneflowers. They are endemic to eastern and central North America, where they are found growing in moist to dry prairies and open wooded areas. They have large, showy heads of composite flowers, blooming from early to late summer. The generic name is derived from the Greek word ‘echino', meaning Sea Urchin, due to the spiny central disk. Some species are used in herbal medicines and some are cultivated in gardens for their showy flowers. A few species are of conservation concern. Echinacea species are all herbaceous, drought-tolerant perennial plants growing up to 140cm in height. Divide Echinacea ‘Rocky Top Hybrid’ clumps when they become overcrowded. Plants usually re-bloom without deadheading, however prompt removal of spent flowers improves general appearance. May self seed if at least some of the seed heads are left in place. Easily grown in average, dry to medium, well-drained soil in full sun. 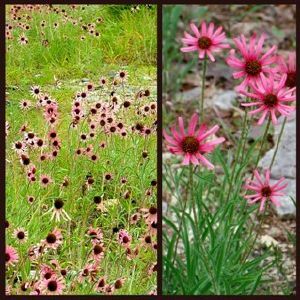 Uses: Group plant in the border, native plant garden, naturalised area, prairie or wildflower meadow. Contrasts well with the related purple coneflowers, Echinacea purpurea. Pruning \ Aftercare : Remove faded flowers.